The Grenztruppen der DDR (Border Troops of the GDR) was headquartered out of Pätz, a small village southeast of Berlin near Königswusterhausen. The Grenztruppen forces were divided into four regional commands The first regional command was Grenzkommando Nord or GKN (Border Command North), with its headquarters located at Stendal and was responsible for the northern sector of the East German border. The GKN consisted of six frontier troops regiments, two training regiments, a helicopter flight and some smaller support units. The second command was The Grenzkommando Süd or GKS (Border Command South) with its headquarters located at Erfurt and it was tasked with guarding the southern border sector. The organizational structure of the GKS was similar to that of the GKN, with six regiments of frontier troops, two training regiments, a helicopter flight and some smaller support units. The third command was The Grenzkommando Mitte or GKM (Border Command Center) headquartered in Berlin-Karlshorst. Grenzkommando Mitte was responsible for manning the crossing points into West Berlin and guarded the entire border perimeter surrounding West Berlin. The GKM consisted of six regiments of frontier troops, one border crossing point regiment, two training regiments, an artillery regiment and some smaller support units. The fourth and final command was The Grenzkommando Küste or GKK (Coastal Border Command) headquartered in Rostock, deployed a coastal brigade (Grenzbrigade Küste) consisting of twelve marine battalions and several boat battalions and companies to guard the GDR's relatively small coastline along the Baltic Sea. For command-and-control purposes, the GKK was incorporated into East Germany's Volksmarine. 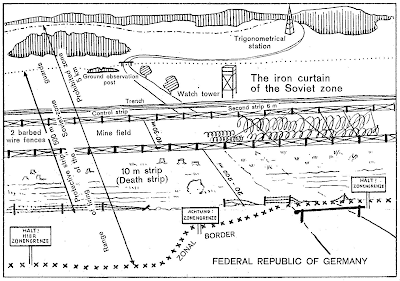 The fortifications of the inner German border was comprised of a complex system of interlocking fortifications and security zones 1,381 kilometres (858 mi) long and several kilometres deep, running the length of East Germany's territory from the Baltic Sea to Czechoslovakia. The outer fences and walls were the most familiar and visible aspect of the system for Western visitors to the border zone, but they were merely the final obstacle for a would-be escapee from East Germany. The complexity of the border system increased steadily until it reached its full extent in the early 1980s. Travelling nominally from east to west, a potential defector would first reach the edge of the restricted zone (Sperrzone), a closely controlled strip of land 5 kilometres (3.1 mi) wide, running parallel with the border. Evading the patrols and watchful inhabitants of the Sperrzone, the escapee would have reached the first of the border fences. 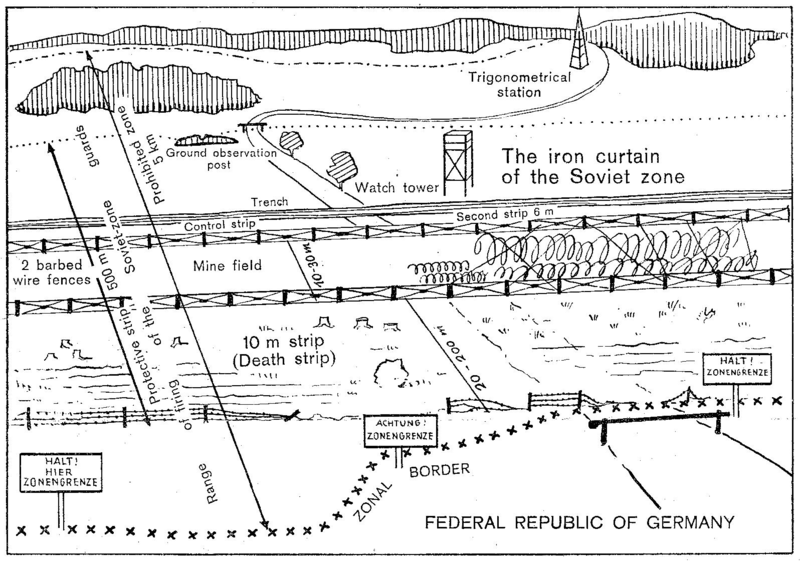 The signal fence (Signalzaun), around 500 to 1,000 metres (1,600 to 3,300 ft) from the actual border, was lined with low-voltage electrified barbed wire which activated alarms when touched or cut. Beyond the signal fence was the "protective strip" (Schutzstreifen). It was brightly lit by floodlights in many places to reduce an escapee's chances of using the cover of darkness. Guard towers, bunkers and dog runs were positioned at frequent intervals to keep a round-the-clock watch on the strip. Crossing the Schutzstreifen, the escapee would next reach the floodlit control strip, often called the "death strip" in the West. Tripwire-activated flare launchers were situated at various points to help the border guards to pinpoint the location of an escape attempt. The last and most formidable obstacle was the outer fencing. In some places there were multiple parallel rows of fences, each up to several metres high, with dense minefields in between. The fences were not electrified but were booby-trapped with directional anti-personnel mines at intervals of 10 metres (33 ft), each one of which was capable of killing at a range of up to 120 metres (390 ft). Finally, the escapee had to cross whatever natural obstacles were on the western side of the border fence as well as traversing a strip of cleared ground that was up to 500 meters (1640 ft) wide. While crossing this outer strip, the escapee would appear in clear view and shooting range of the border guards before reaching the safety of West German territory. 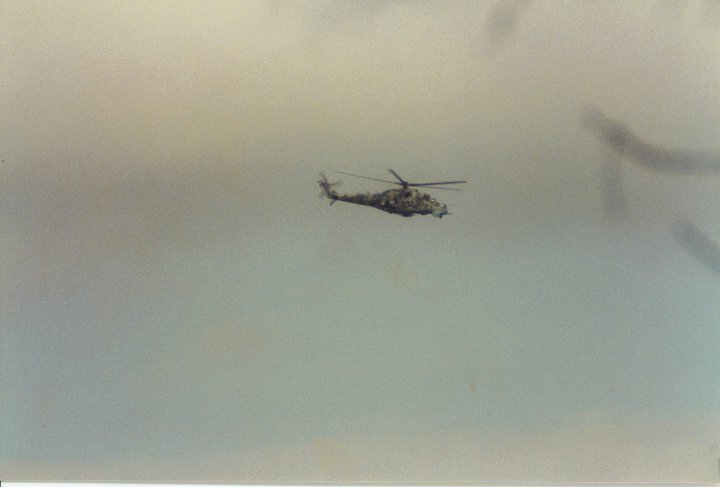 An East German Mil Mi-24 Hind D gunship helicopter patrolling the border region with West Germany. 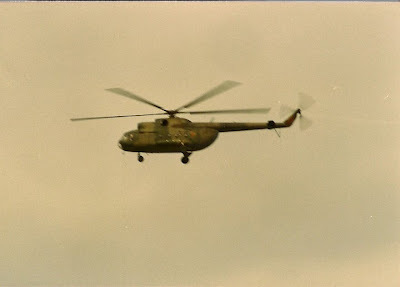 In its efforts to effectively patrol and police the sensitive border region with the West, the Grenztruppen der DDR maintained its own fleet of helicopters with multiple Grenzflieger (Border Flying) units operating a number of helicopters to provide aerial surveillance in support of border protection operations. The Grenzflieger service operated three squadrons of helicopters, a squadron of Mil Mi-24 Hind D gunship helicopters out of Steinheid, a squadron of Mil Mi-8T Hip utility helicopters out of Kreuzebra and another squadron of Mil Mi-24 Hind D gunships out of Meiningen. The uniform displayed here is of a Feldwebel (Sergeant) in the Grenzflieger service of the Grenztruppen der DDR (Border Troops of the German Democratic Republic). Grenzflieger uniforms were made of a different material than standard NVA uniforms being made from wool rather than the standard gabardine material. The visor cap shown here for a non commissioned officer in the Grenztruppen der DDR's Grenzflieger service. It retains the stone grey color of National Volksarmee uniforms along with its associated dark green piping of the Grenztruppen der DDR but also note the distinctive Air Force propeller in wreath insignia of the flying service. Note the distinctive Air Force style variant of the national insignia with the Hammer and Compass roundel encircled within a wreath with wings extending from it and in being a non commissioned officer's visor there is no silver braiding only a black plastic capband. Note the interior marking of NVA for the East German National Volksarmee. This visor example shown here carries a letter 'H' designation meaning the visor was manufactured in 1984. The size of this example is 59cm or 7 3/8in by American sizing equivalents. Shown here is the Kragenspiegeln (Collar Insignia) of a Grenztruppen Grenzflieger non commissioned officer. It is essentially air force style collar tabs with a pair of wings against a green fabric patch of the Grenztruppen service. Also note the silver collar tress of a senior Non Commissioned Officer grade. Shown here is a close up of the shoulderboard insignia for a Feldwebel in the Grenztruppen Grenzflieger service with the silver tress of a Senior Non Commissioned Officer around the border of the board along with the single silver pip of a Feldwebel. A Feldwebel is essentially the equivalent of a Staff Sergeant in American Army equivalents or a Sergeant in the British Army. Shown here on the right side of the dress tunic is are the decorations of an enlisted man or a non commissioned officer. Displayed here is the Schutzenschnür (shooting lanyard) of the Grenztruppen. The East German Armed Forces maintained multiple variations of the shooting lanyard for varying specialties of the military including armored forces, infantry, rocket/artillery troops and the Grenztruppen. Also displayed on the uniform is the Grenztruppen Bestenabzeichen (Best Soldier Badge), Grenztruppen Klassifizierungsabzeichen (Classification Badge) similar to the West German system of Tätigkeitsabzeichen and finally an NVA Militärsportabzeichen (NVA Sports Badge). Here is a close up of the silver Grenztruppen device on the Schutzenschnür. It displays an AK-47 assault rifle against an East German border marker surrounded by a pair of oak leaves. It then is attached to a silver colored cord which is mounted first to the button on the right shoulder underneath the shoulderboard and the end of the lanyard attached to the top button on the uniform tunic. Here is a picture of the Grenztruppen Bestenabzeichen (Best Soldier Badge) in 4th Class. It is essentially a gold AK-47 barrel with attached bayonet against a green background the color of the Grenztruppen. Across the top is the word 'Bester' (Best) and across the bottom are a pair of oak leaves and the number 4, representing the fourth class of the award. Displayed here is the Grenztruppen Klassifizierungsabzeichen (Classification Badge) in 3rd Class with an AK-47 assault rifle against an East German border marker in gold against a green center, surrounded by a pair of oak leaves and the East German coat of arms with a hammer and compass at the top and the number 3 for the third class of the badge and essentially wings protruding from the ends of the central round. Here is the NVA Militärsportabzeichen (NVA Sports Badge) essentially an Oval-shaped gold pin-back badge with a flag design featuring the letters “NVA” for the National Volksarmee (National Peoples Army) rimmed by the state motto 'Für den Schutz der Arbeiter und Bauern Macht' (For the Protection of the Workers' and Farmers' Power) and national coat of arms of East Germany. Again shown here is a close up of the cuff title of the Grenztruppen der DDR sewn against the left sleeve of the tunic. The interior of the Grenzflieger service tunic displaying the NVA stamp. Displayed here is the gray dress shirt issued to regular soldiers in the armed forces for wearing underneath the uniform tunic along with the dark grey NVA tie and the stone grey trousers worn by the Grenztruppen. As these are a different material than the standard gabardine, and the soldier is not an officer there is no colored striping down the length of the pant leg. On certain occasions the jacket could be removed and this variant of the uniform worn. All shirts in the East German government had loops on the shoulder for mounting rank shoulderboards when not wearing the jacket. In summer and warm climates, the tie could be removed and the shirt collar worn open. The stone grey service trousers worn by NVA and Grenztruppen personnel this example of the matching wool material of Grenzflieger non commissioned officer uniforms. Here is a close up of the black leather belt worn around the waist of the service tunic. It is similar to the belts worn around the waist of the tunics on Bundeswehr uniforms however this belt features a silver metal buckle with the East German coat of arms in the center. Adjusting the belt to size was made possible by sliding access through the underside of the buckle and secured using two metal prongs which secured through holes in the belt. Displayed here is a close up of the silver buckle if the belt. This belt was issued to all NVA service members. . 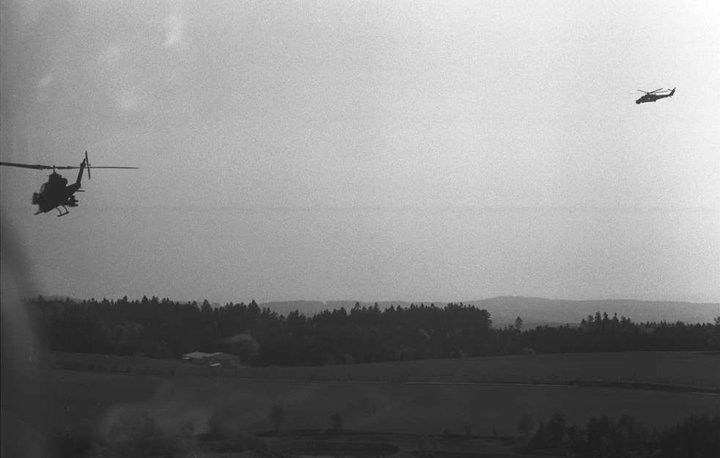 It was not uncommon for Grenzflieger aviation units to encounter western aircraft patrolling along the border and essentially shadowing them mimmicking the altitude and attitudes of Western aircraft. 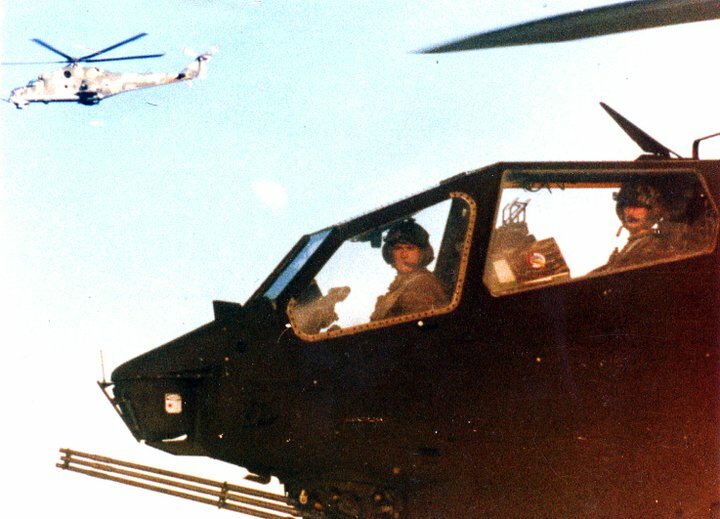 There was atleast one report of a Hind gunship shadowing a U.S. Army AH-1 Huey Cobra along the border region and the Cobra pulled into a hover and turned to face the enemy aircraft however when the Hind tried the same maneuver, the Soviet designed aircraft being heavier and less agile was unable to handle such a maneuver and crashed into the dense forest below. 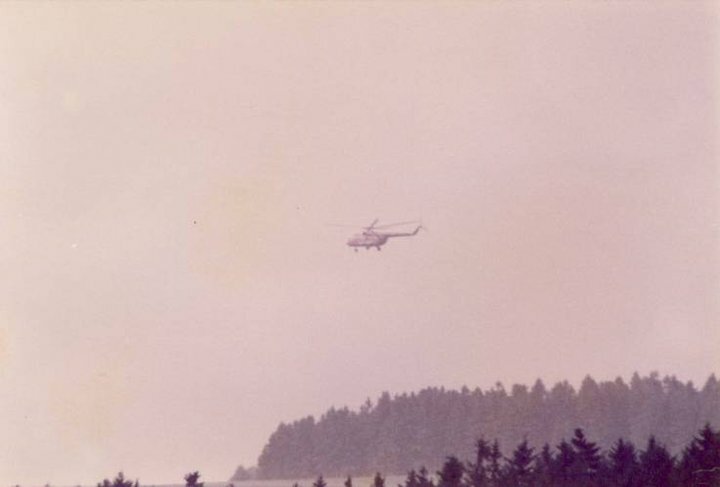 In extensive measures often taken by the East German communist regime, the following day patrolling Western aircraft flew along the area of the crash observing into the East only to find the crash site had been policed with the debris removed and all the scorched landscape painted green as if the incident never happened.